Syncretism Seminar- The Zodiac Stronghold: Worship of the host of heaven. The old religion of Babel is a scheme of the devil, luring everyone in their pursuit of love. Worshipping (fearing) the omens of animal shapes thought to be living in the sky, mankind has a long record of idolatry inherited from the woman of Revelation 17, Babel. False behavior and beliefs have been embraced by some modern Natsarim. Some teach that the secret mystery of deliverance has been “written in the stars”, an idea first published in a 19th century novel called MAZZOROTH. This seminar uses Scripture to debunk any notion that the constellations, or many other pagan practices, are in any way acceptable to our Creator, Yahuah. There is crushing evidence that syncretism (especially the zodiac) arouses His most fierce wrath. Stephen confronted the Sanhedrin with their fascination with the host of heaven! We must be alert to any false teachings concerning the return of Yahusha that are derived from interpretations promoting the “signs” (constellations) of the heavens. Syncretism is mixture, especially the mixture of differing belief “systems”. The dragon invented the zodiac, but Yahuah made the stars themselves. No matter who may say so, the secret of deliverance is not found in the stars, but rather it is found in the prophetic Word of Yahuah. 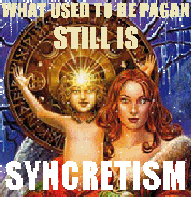 You can watch the video from our blog.Syncretism - Zodiac Stronghold. To understand how the world follows many false beliefs, guided by various “religions” they put their trust in. check out the DVD on Pluralism.